When did that error happen? For some reason level 0 was reported(+0 - Black Rook Hold), which is wierd because mythic+ starts at 2. I use ELV_UI and I think this might be due to it, I'm not sure. But the times on 2 and 3 chest the green text, is overlapping with the white. Any way to fix this with ELV_UI or possible to make it more customisable? ELV_UI changes the default font family. I am looking into configurable fonts,... but currently it is not supported. Hi, thanks. Yep that is known. Will be fixed in the next minor version. That error occurs if you try to move the fixed frame, you need to call the toggle command first. I'd like to suggest that /mpt toggle works outside of instance, so you can move the addon freely without actually being in a dungeon running on a timer. Hey it's great ! Would that be possible to have a frame around the timer, with a 50% opacity for example ? Hello really good addon ! possible options ? 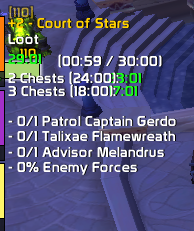 It's possible to chose anounce timer on /gr ? exemple Each boss : [record timer - boss] [+ x second or - x second] best run ! sorry for my english, and ty i hope this options will comming ! Hi, thanks for the suggestion. Will consider it for the next version. - Can you make it easier to set the addon position and scale. Having to be inside an instance to set the position is confusing. - Would like to still see the timers when we finish the run. Right now the whole addon disappear when we finish the run. - Basic options menu would be amazing. Changing colors, sizes, font etc. I will look at this things for the next update.